A new video is here! Created by Creative Works in cooperation with Olena Minina from Ukraine and shot in Budapest, the video has a truly international feel. If you haven’t heard of Olena Minina, we don’t know where you’ve been because she’s just won the World Pole Art Championship in Italy and it’s safe to say her performance was amazing! That doesn’t come as a surprise to anyone who knows her, though – she has won a few big competitions before and she’s a true perfectionist which reflects in all her tricks. You can find a link to that performance on her Facebook and you should follow her Instagram for some seriously impressive tricks. Tamara and Ondra, the Creative Works team managed to fit in the shooting with Olena between her workshops and being a member of a jury of the Pole Theatre Hungary competition. The Pole Theatre is, by the way, one of the most entertaining pole competitions and there are real pole stars, including Olena, judging the performances. Despite her very busy schedule (and many stairs, haha), Olena was very relaxed, full of energy and smiling the whole day. 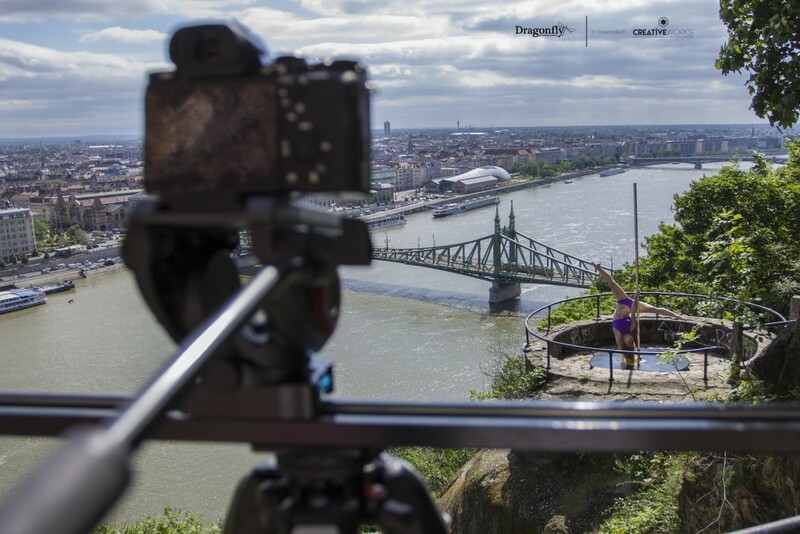 Watch her do some incredible tricks with amazing views of Budapest – you can see the stage we were using for this video was truly tested. We didn’t use the spin version of the pole this time because, as Ondra says, we didn’t want to see Olena fly over the railing but we were holding our breaths anyway, watching her do a somersault on top of the pole. You can see the whole video here but we also have a few backstage shots for you, including a greeting from Olena :). By the way, if you’re looking for some spring outfit inspiration, Olena is wearing the Lisette Halter Neck Top and Vera Pole Fitness Shorts.